Somewhat belatedly a very Happy New Year to you all. I hope 2019 is happy and healthy. As many of you will know Margot and I have been part of the Notts support group responsible for setting up Wollaton U3A. The group is now up and running and the Inaugural Meeting, attended by well over 200 people, was very successful. They are meeting at 10am on the 4th Tuesday of the month in St Leonards Community Centre. The steering committee has worked very hard to reach this point and Mike Johnson is the Chair. We look forward to supporting and working with them, but they will not be part of our cluster for at least a year so if you want to attend their groups you will need to join Wollaton as well as Beeston. Many thanks to all the group leaders who attended the meeting/lunch on January 18th. We had a full agenda including a presentation on Beacon given by Celia Billau. We hope that eventually all our group leaders will use this system including the ledger. This is definitely the way forward and certainly makes life easier once people are used to it. Please remember that help is always at hand if you don’t understand how to set it up or experience any difficulty. On the subject of Beacon thanks to the members who have renewed their membership online. We hope you found the instructions easy to follow. Again, I think this is the way forward as our membership continues to grow making the administration of renewals a bigger job each year. We are delighted that our membership continues to grow quite rapidly and after the last open meeting we had a total of 873 members making us larger than many other U3As across both the region and indeed the country. This obviously leads to the need for more groups and more helpers. As I say frequently (sorry to be boring!!) U3A is not a service it is an organisation for the members by the members. Some of our long-standing members have played their part and now deserve to take a back seat. So, come on newer members what can you do? Surely we shouldn’t be short of help with such a large membership?!!! We are always needing folk to start groups. You don’t have to an expert but just have an interest in a subject. Many of our groups are now led by small teams so the responsibility doesn’t rest on one person’s shoulders. We often need help when we need to start new groups because the current ones are full. For example we now have 4 table tennis groups, 3 wine tasting groups and 5 book groups. It is so helpful when members in the current groups help to get the new group started and share their expertise. Several times in the past we have tried to set up a REALLY USEFUL GROUP (RUG) without much success. This would be a group of people who help occasionally and sometimes on a one-off basis. It might be helping a committee member who is involved in a project or organising an event. It wouldn’t take much, just a bit of help and time now and again. Now on to the committee!! We have had a stable committee for the past few years, but this is changing in May at the AGM which will approach very quickly once Christmas is over. In May several long-standing members will be standing down. Although they will really be missed it is good to have new blood bringing fresh ideas. All committee members have an induction and support from the more experienced members. Please let us know if you would like to know more. You are very welcome to come to a committee meeting as an observer. We also need help with refreshments. Serving so many members at the open meeting is really hard work so if you are able to help Elaine Neville and her team occasionally please let us know. The more folk in the team the less demanding it is and the less often you will be asked. If you think you might be able to help or would like further information please email me at chair@beestonu3a.org.uk or Celia at communications@beestonu3a.org.uk or speak to me or any of the committee members at an open meeting. Suddenly we find ourselves in August and the Group Fair isn’t far away. This event which was originally planned for March will now take place on October 4th at the Pearson Centre next to Beeston library from 10-12 noon and will replace the normal open meeting. This event is an opportunity to attract new members and for groups to showcase what they do even if they are full. If your group is full and people are able to put their names on a waiting list, it lets us know if we need to try to set up an additional group. We hope all our groups will support this event and be represented. At the Pearson Centre all groups will be in the main hall hopefully in alphabetical order as much as we are able, so no-one will be tucked away. There will be the opportunity for groups to perform where appropriate and I will send out a timetable/programme in due course. Please let Chris Chater or Celia Billau know if your group needs something special e.g. to be situated near a plug etc. Please encourage your family, friends and neighbours to come along to see what Beeston U3A has to offer. Many thanks to all the members who contributed to the fantastic collection we had for EMICS at the August open meeting. Dr Tim Grey was an inspirational speaker providing an amazing service and he was delighted to receive almost £400 from our on the spot collection. January 18th Thank you lunch and meeting for Group Leaders at Christchurch 12 noon. We were very pleased to receive the responses to the questionnaire. Many thanks to the folk who took the time and trouble to fill it in. This was a forum for you to have your say. We were delighted with the many very positive comments and we were praised for good communication, welcoming atmosphere, excellent outings and speakers and the variety of groups. Problem hearing in parts of the church balcony. It would be better if members who are hard of hearing sat down stairs in the reserved seats at the front. Crowded open meetings and hard to get a drink. We have moved the refreshments into other rooms to try to make it easier and safer. Encourage more ethnic minorities to join U3A. We will look at this issue when we formulate our Equality/Diversity policy later in the year. This policy would include reaching out to people from all walks of life. Identify more venues. Chris Chater our group co-ordinator has a list of possible venues in Beeston and the surrounding area. Continue to promote 2nd, 3rd, 4th groups etc. This is happening. Explain locations of meetings for people who aren’t from Beeston. We will look at this and see if we can put something on the website. There were some good suggestions for new groups. Several of the suggestions already exist e.g. Rummikub and Bird watching. Members can find all existing groups listed on the website and in the newsletter. We will be working through the suggested list and we will hold meetings to assess the interest and to find folk who may be interested to helping to organise the groups. We were delighted that several members said they may consider joining the committee in the future. This is particularly important because several long-standing committee members, including the Chair, will leave this time next year. There seemed to be a considerable interest in the possibility of a Study day with some very good suggestions for a suitable topic. Hopefully the day will take place in Autumn 2018 or Spring 2019. We asked how members would feel if they were given the option to pay the annual subscription by PayPal. Opinion was divided but this is likely to go ahead for those who wish to pay that way. Beeston U3A continues to thrive and membership is now more than 800. Our numbers are rising each month and we are delighted that our popularity continues to grow as we cater for people in the locality with a wide range of needs and interests. We average between 12 and 20 new members at each monthly meeting and we are now considerably larger than other local U3As. Members sometimes ask us if we are getting too big but we are lucky that currently we can accommodate everyone who wants to come to the open meetings and as long as we continue to extend our range/number of interest groups we can continue to expand. Our increasing membership creates a lot of work for Margot Gale, our very efficient membership secretary, particularly at renewal time. We have adopted the U3A electronic Beacon System which allows us to record members details and extract useful information and we look forward to providing the opportunity for paying the annual subscription on line for those who wish to do it this way. We are delighted that many group leaders are also finding it a very useful tool. There is a possibility that a Wollaton U3A will be established in the next year or so and if this happens we look forward to working with them. Our rise in membership and careful management by Malcolm Brookbanks and Jo Muxlow our treasurers has led to surplus funds and this has meant that we have been able to reduce our subscription for 2018/9 to £12. Anne Pinnock, who will join the committee as a co-opted member after this meeting, will work alongside Chris Chater for the coming year. Ecology/biodiversity, Walking football or netball, Learning to sew, History of Aviation, Music and movement and Snooker. Our excellent group leaders have ensured that their groups have continued to be lively and interesting. These folk, as I’ve said many times, are the backbone of Beeston U3A and the committee can’t thank them enough. Art Gallery Visit members have had many visits, organised by Barbara Johnson and Nadya Lancaster, which include the Djanogly Gallery, Newark Town Hall, New Walk Gallery Leicester, Nottingham Contemporary, Collection Gallery Lincoln and the Harley Gallery. Some members of the Wine Appreciation Groups joined members of the Nottingham Wine Group again and visited Verona and Venice last June and a similar visit is taking place for the third time this year. The theatre group continues to be extremely popular and Eve Gurd works very hard organising tickets for productions in local theatres. The Garden visit group led by Sandy Banks have enjoyed many days out and these have included visits to the RHS Chatsworth show, Nottingham Park Garden Trail, Cossall open gardens, they have also visited Cambridge Botanical Gardens, Bridgend, the Hidden gardens of Easton Lodge, Beth Chatto Garden, Lode Mill, Marks Hall, Anglesey Abbey, Sandringham show and Little Morton Hall/Biddulph Grange. Several groups have made requests for financial support to buy equipment/ subscriptions etc. We welcome these requests and the committee is keen to support them whenever possible. Examples over the past year of requests that have been granted, include a new laptop, a CD player, speakers, wine glasses, card tables and yoga blocks. 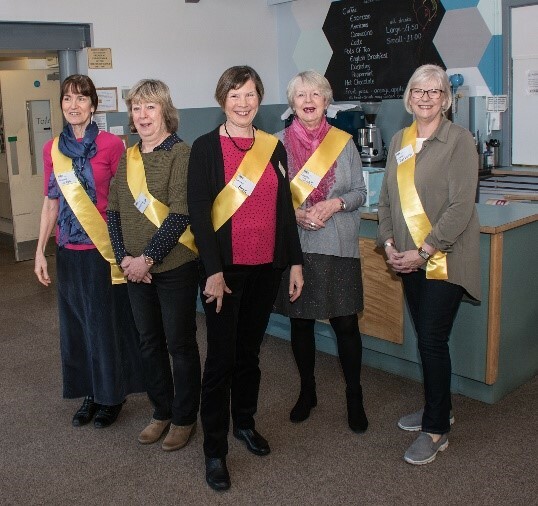 In March, we planned to hold our annual Group Fair when we would have the opportunity to showcase our U3A and give groups the opportunity to recruit new members. After comments made by group leaders last year we had arranged to hold the event in a new venue i.e. the Pearson Centre. This would have given us much more space and allowed all groups to have tables in the same room. There was also a stage for performances and then it all went wrong when heavy snow fell, and we had to cancel! The event will now take place at the Pearson Centre in October and we’ll have a break next year. During the year, we have also held a range of evening social events and these have included another Fine Wine Tasting led by Piers Krause, a Murder Mystery evening, a Ceilidh, and a Quiz. Many thanks to Janis Patterson for her hard work. We celebrated Christmas with seasonal refreshments and entertainment by the Ukulele, Singing for fun, Let’s right Shakespeare and the Play reading groups. We were also entertained by a Barbershop quartet called Central Locking. The winner of the short story competition was also announced. Congratulations went to all the folk who had entered and the winner Sue Daly a cluster member from Long Eaton was presented with a £25 book token. The competition is taking place again this year. We are always keen to hear the views of members and we have recently sent out a questionnaire seeking members views. As a committee we are extremely grateful to the members who took the time and trouble to fill it in and return it. Your comments will inform our updated development plan and a summary of the responses appears later in this newsletter. We always try to listen to members suggestions/concerns and act upon them when we can. An example of this is our move away from plastic cups. We now ask members to bring their own. The annual group leaders meeting was another opportunity for members to make suggestions for improvements. We have also moved the refreshments to other rooms to try to make it a little calmer. Lucy Beardsley continues to organise an excellent range of speakers and she and Breda Cooper have also arranged some outstanding visits over the past year. These have included two visits to the Charles Hanson Auction House to see the filming of Bargain Hunt, a trip to Lichfield and overnight visits to the Thursford Spectacular and Blenheim Palace. Another area for development has been to forge links with local colleges/ universities. Despite starting very well and being very successful our links with Central College have ceased. This is disappointing, but the college didn’t seem to have the necessary resources to continue. However, during the year we have developed our working relationship with Nottingham Trent University and have been engaged with a retail research group in their Business School about grocery shopping and older consumers. In May and June, we circulated an anonymous online questionnaire to members and there were over 170 respondents who provided invaluable research data about their grocery shopping habits. Steve Austin then participated in their Academic Conference in July where he presented the results of the survey. A group of 18 members then volunteered to take part in more detailed focus groups held at the University in November. This provided the NTU research team with over three hours of transcripts which they are currently analysing with the objective of publishing an academic journal article later this year, and so hopefully increase major retailers’ awareness of the needs of the older shopper. We also strive to keep up to date with local and national U3A initiatives and then, where appropriate, feed back to you the members. Margot Gale, our Vice Chair and Membership Secretary and I attend the Nottinghamshire Network meetings and disseminate any relevant information and several committee members have been to local workshops. I have recently trained to be a volunteer to help with setting up new U3As locally. We were well represented at the National Conference at Nottingham University and I summarised the main findings in the newsletter. Any member can apply to the committee for sponsorship to attend the conference which includes the AGM. As well as excellent speakers, there is the opportunity to attend workshops and exchange ideas with members of other U3As. It will be held at Nottingham again at the end of August. We also feel it’s important to co-operate with the other U3As in our local cluster i.e. Long Eaton, Ilkeston, and Stapleford. I meet with the Chairs of these U3As every six months, so we can exchange ideas and learn from each other. Only this week Malcolm, Margot, and I attended a national U3A workshop in Birmingham where the topics discussed were Data Protection, Equality, Safe Guarding and Insurance. As I’m sure you are aware new data protection regulations known as GDSR come into force at the end of this month. We have set up a subcommittee to tackle any changes that we need to make and we will ensure that we keep you informed and we’ll shortly be holding a group leaders meeting to ensure they are fully conversant with the implications and what they need to do. We will be formulating policies for Data Protection and Privacy so that you know how any information we have about members is protected. I am aware that I say frequently that U3A is for the members by the members and one of our aims is to involve more people in the numerous tasks necessary in running a successful U3A. Whenever possible members are expected to give as well as take. We are not here to provide a service but to help each other and be prepared to play our part! It can be very frustrating and a bit soul destroying when help is needed in a group and no-one is prepared to give it. Last year we appealed for some help for Janis who organises the social events but not a single person came forward and offered their services which was disappointing. However, we do have non-committee members who help enormously. We couldn’t manage without our meeters and greeters, the refreshment team and those who sign members in, but more are always needed. Other helpful people are Mike Allery who does numerous IT tasks with such willingness, Mike Johnson who takes our photographs and Eve Gurd who helps to set up the room for open meetings and looks after the signs we have on the tables. If you feel you could give a little help in any way, please please let us know. We like to make all our volunteers feel valued and to let them know that we don’t take them for granted. To show our appreciation we held our annual thank you Christmas coffee morning at the White Lion and a thank you lunch and meeting for our group leaders. Communication is an area that many members have praised in the questionnaire. Celia Billau our communications officer works tirelessly to send out information to you. Please can you ensure that you tell us when your details change. Celia has now taken over the newsletter from Marie Potts and the excellent quality has been maintained. 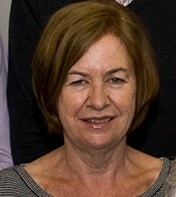 She also produces a very useful interim bulletin and manages our Facebook page. I would like to take the opportunity at this point to thank Marie for everything she has done for Beeston U3A over the last seven years. She really has been instrumental in our success and we are really going to miss her input at committee meetings. We wish her well and are really pleased that we will still see her around as she will continue to be a member. I’ve already got her lined up to be a regular meeter and greeter. 1. To further develop the use of the Beacon system particularly looking at the opportunity for members to pay on line. We have already established a subcommittee to look at this. 2. To continue to extend the range of interest groups and to revamp the pack for new group leaders. 5. To hold a meeting for group leaders so that they understand the data protection issues. 6. To devise a policy for safe guarding and equality. 7. To feedback to members on the results of the questionnaire and implement any changes arising from comments/suggestions made. 8. To prepare for succession planning in readiness for any committee changes in a year’s time. 9. To look for ways to encourage more members to take an active role within our U3A. 10. To continue to plan for the challenges brought by the ever-increasing membership. I’d like to finish by thanking you all most sincerely for continuing to be part of Beeston U3A and hopefully we look forward to another successful and exciting year together. March 2018 Newsletter – A Message from the Chair, Sue Blackley. We had a very successful group leader meeting at the end of last month. It was vey well attended and I would like to thank all those folk who gave up their time and came along and supported the event. We have had some very positive feedback and following a presentation at the meeting we are delighted that so many group leaders are showing an interest in using the electronic national Beacon System to manage the membership of their groups. Celia Billau, our communications officer, is holding a help desk at our open meetings to aid anyone with queries/difficulties. We are very proud of our group leaders who work so hard to sustain the interest in their groups. As I announced at the last open meeting we will shortly be sending out a questionnaire to all members. Your opinion is very important to us and we would like to know what you think our U3A does well and anything you think we might improve upon. It’s important to remember that as a committee we are just a group of volunteers trying our best to please almost 800 members with diverse interests and opinions. We hope you will spare a few minutes to fill it in so that your ideas can feed into our development plan for the next year. We are always striving to improve as we want Beeston U3A to be one of the best! 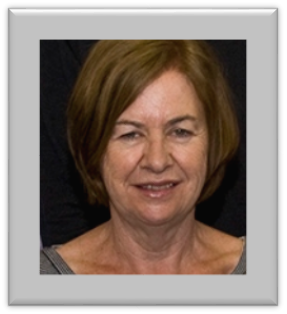 I am pleased to announce that Kathy Shipway is being co-opted on to the committee from March. Initially she won’t have a specific role but will assist other members as she gets used to the way we work and the responsibilities of a trustee. Many thanks to Janis Patterson for organising such a successful Barn Dance. We now look forward to a Quiz Night on April 20th. December 2017 Newsletter – A Message from the Chair, Sue Blackley. I would like to begin by thanking Marie Potts for the tremendous newsletters she has produced over the last six years or so. Thanks to Marie’s dedication and attention to detail the quality of our newsletter has been admired by you the members and many other U3As. We are very pleased that Marie will stay on the committee until May. This brings me on to the next point which is planning for the future. Succession planning is a standard, but very important, item on our committee meeting agenda. However, we can’t develop a succession plan if we don’t have any volunteers. Many of our committee have already served for several years and may be considering a break in the not too distant future. When this happens, we will need new people to take their places. If you think you may be interested, you are welcome to attend a committee meeting as an observer and there would also be the opportunity to shadow a current member. We are a friendly group who share the responsibility of running our U3A but if there is no committee then there would be no U3A!! It is also very healthy for the organisation to have new blood bringing fresh ideas. Please let a committee member know if you would like to find out more with no obligation! Off my soap box now and I would like to take this opportunity to wish you all a very merry Christmas and the very best for 2018. June 2017 Newsletter – A Message from the Chair, Sue Blackley. For the benefit of those members unable to attend the AGM in May, here is my Annual Report. Following the last AGM in May 2016 the year began with a celebration tea party in June for our 5Th anniversary. 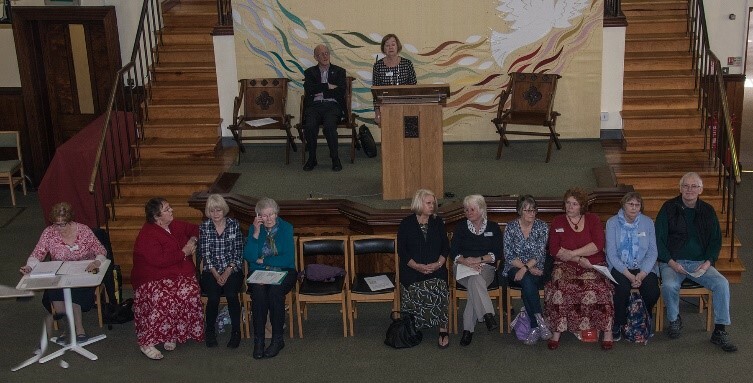 This was attended by around 100 members including the former chairs Sue Cotton and Liz Barnes. Sue Cotton who was the first chair told members how the U3A started in Beeston and she cut the cake. A good time was had by all and I received many emails and letters of thanks saying how much folk had enjoyed it. Beeston U3A continues to thrive and membership is reaching almost 800. Our numbers are rising each month and we are delighted that our popularity continues to grow as we cater for people in the locality with a wide range of needs and interests. In order to move our organisation forward we have been working to a development plan compiled by the committee, considering members comments and national and local issues. This plan is regularly reviewed, revised and brought up to date. A major area for development was to continue to make our U3A vibrant and appealing to all members. Included in this area is the constant need for more interest groups. We are also trying to start some groups that will be particularly, but not exclusively appealing to men. Chris Chater has worked tirelessly and the past year has been very successful in extending the range of interest groups on offer. We now have 67 interest groups which is an increase of over 20 since the last AGM with second or third groups being set up for table tennis, Latin, ukulele and wine tasting and we are up to our 5th book group. We are aware that it is very frustrating for new members if they are constantly told that groups are full and consequently we are working hard to set up additional ones where it is apparent there is a need. This also depends of the goodwill of members being willing to take on the tasks involved in running a group. As a committee, we are pleased that there is a definite move towards team leadership so that the load is shared. We are so grateful for all members who help to run groups. You really are the essence of U3A and without your willingness, hard work and enthusiasm we couldn’t exist. New groups established this year include Real Ale, Singing for fun German Beginners and Improvers, Greek Ambling ArchitectureLearning to programme, Medieval History, Italian, Searching Antiques, Golf, Needles and Wool.Quiz, Psychology and Sociology. Several new groups are also in the pipeline and include Beginners Recorder, 5th Book Group, 2nd Medium Walks.Once again, our groups, overall, have been very active and successful and a number have arranged visits to places of interest. We are particularly grateful to Helen Stewart who continues to run four very popular groups. Recently she also organised a very successful visit to Florence for Art History Group members. She has also organised a Beeston U3A creative writing competition. Art Gallery Visit members have had many visits, organised by Barbara Johnson and Nadya Lancaster, which include the Djanogly, Contemporary, Leicester and Harley Galleries. Some members of the Wine Appreciation Group joined members of the Nottingham Wine Group and visited Verona and Venice last June and a similar visit, organised by Piers Krause, is taking place this year. The theatre group continues to be extremely popular and Eve Gurd works very hard organising tickets for productions in local theatres. The Garden visit group led by Sandy Banks have enjoyed several days out and these have included visits to Castle Howard, Southwell Apple Weekend, Cambridge University Botanical Gardens and three days in Cardiff when the group visited six gardens. Elizabeth le Marchant Brock certainly deserves a mention here as she is the administrator for four groups as well as running the new member’s coffee morning and being an ultra-efficient minuting secretary.Several groups have made requests for financial support to buy equipment/subscriptions etc. We welcome these requests and the committee is keen to support them whenever possible. Examples over the past year of requests that have been granted, include a library subscription for the play reading group, 4 card tables for the Bridge Group and the cost of setting up a website for the Writing for Pleasure Group.In March, we held our annual group fair enabling group leaders to showcase their groups, recruit new members and gather waiting lists where the groups were already full. A considerable number of visitors attended the event and consequently we gleaned around 30 new members. There was a great buzz around the place and many very positive comments. After the event Group leaders had the opportunity to send comments/suggestions to the committee on possible improvements for next year which we will take on board wherever possible. Much of the preliminary organisation was done by Marie Potts and Celia Billau our new Communications Officer. Consequently, thanks to them, the event ran very smoothly. During the year, we have also held a range of evening social events and these included Fine Wine Tasting led by Piers Krause, a Quiz and an excellent Burns Supper and Ceilidh organised by Janis Patterson.We celebrated Christmas with seasonal refreshments followed with entertainment by the ukulele and singing for fun groups and an A Cappella male voice choir.We are always keen to hear the views of members and have recently introduced a forum on our website and opened a Facebook page. These are additional mechanisms whereby members can advertise what they do, share their opinions/ideas and help us to strive to provide what members want.The annual group leaders meeting was another opportunity for members to make suggestions for improvements. 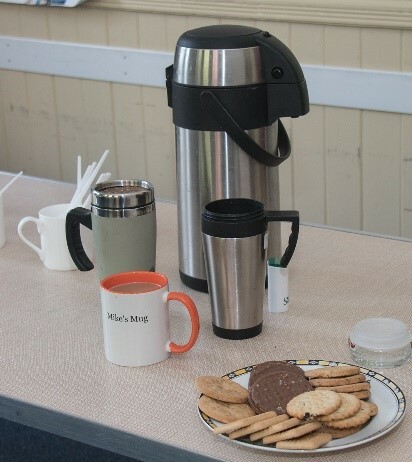 One thing they shared was that some new members find the hustle and bustle a little overwhelming when they come to their first open meeting and so we are trying to find a quieter and calmer place for coffee which is proving quite a challenge and we still haven’t found an ideal solution. Lucy Beardsley ensures that we continue to have a wide range of interesting speakers and particularly notable ones in the past twelve months have been Dr John Dornan, John Wilson and Jane Barnes.Lucy, ably assisted by Breda Cooper, has also arranged some outstanding visits to places of interest including Hodsock Priory, Lichfield, The Globe, and Highclere Castle where members stayed overnight.One of our continued development areas is to forge links with local colleges/universities hoping eventually to glean mutual benefits. Despite much effort and willingness this isn’t easy. However, there have been significant links with Central College. A considerable number of members have attended IT sessions at the College which have been highly successful. We hope this will continue but is currently being hampered by lack of resources at the college. There may be the opportunity for members to attend some IT sessions within our cluster of U3As. These are organised by Stapleford U3A and take place in Stapleford library. Our links with local universities has been slower but certainly not through lack of effort. We are currently in negotiation with Nottingham Trent University and hope we will be involved in two research projects soon. (more details to follow) We hope this will be the beginning of a successful relationship with NTU with benefits on both sides. Steve Austin has been the main contact here assisted by Richard Eddleston. Thanks to them for their continued efforts. Following on from our study day on Shared Learning projects last April a small group, led by Gill Morral, was set up looking at the history of the old police station. Unfortunately for various reasons the project hasn’t continued. I do hope there will be opportunity in the future for more shared learning projects to develop. I would also like us to run some study days with guest speakers and workshops so please let us know if there is a subject you would be interested in and we’ll see if we can set something up. Another priority is to ensure that we stay up to date with local and national U3A initiatives and feed back to you the members. Margot Gale, our Vice Chair and Membership Secretary, attends the Nottinghamshire Network meetings and feeds back information and several committee members have been to local workshops. We were well represented at the National Conference at Nottingham University and Margot and Malcolm gave a very informative presentation about it to members at the October open meeting. Any member can apply to the committee for sponsorship to attend the conference which includes the AGM. As well as excellent speakers, there is the opportunity to attend workshops and exchange ideas with members of other U3As. It will be held at Nottingham again at the end of August. We also feel it’s important to co-operate with the other U3As in our local cluster i.e. Long Eaton, Ilkeston and the latest member Stapleford extending the opportunities that we can provide and learning from and helping each other. As I say frequently U3A is for the members by the members and one of our aims is to involve more people in the numerous tasks necessary in running a successful U3A. Members are expected to give as well as take. One way we would like members, other than just the committee, to be involved is by establishing working parties and small groups to achieve specific tasks. After attending a workshop at the national conference, we realised that it would be advantageous to many members if we formulated an accessibility policy. Consequently, we set up a working party and were delighted when Anne Pinnock, a non-committee member offered to lead the necessary research. Anne and the other members of the group, in consultation with members and group leaders, have done an excellent job and Anne, who now has an official title of Welfare Officer, will talk to you about the policy at a later meeting and Margot will give you a progress report today. Another non-committee member Bill Pavlides has also offered to help Chris Chater in her role as group co-ordinator. 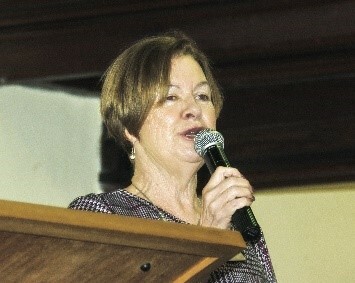 Now we would like some occasional help for Janis Patterson our event’s organiser. 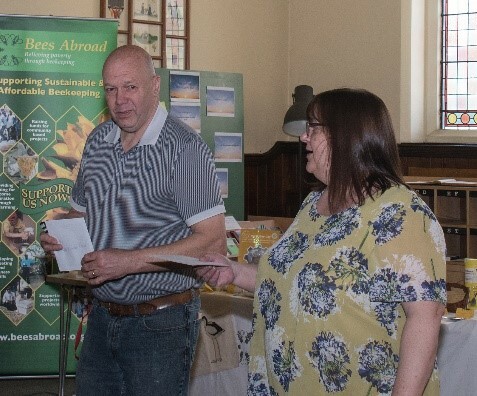 Other non-committee members who help enormously are Mike Allery who does numerous IT tasks, Mike Johnson who takes our photographs and Eve Gurd who helps to set up the room for open meetings and looks after the signs we have on the tables. If you feel you could give a little help in any way please please let us know. As well as needing more group leaders we also need more ‘Meeters and Greeters’ and more people to help with refreshments. One of our priorities is to make our volunteers feel valued and to let them know that we don’t take them for granted. To show our appreciation we held a thank you Christmas coffee morning at the White Lion. We wanted to say a thank you to all the Meeters and Greeters, the folk who sign members in each month and take subscriptions and the members who serve the tea and coffee and other very helpful members who have already been mentioned. 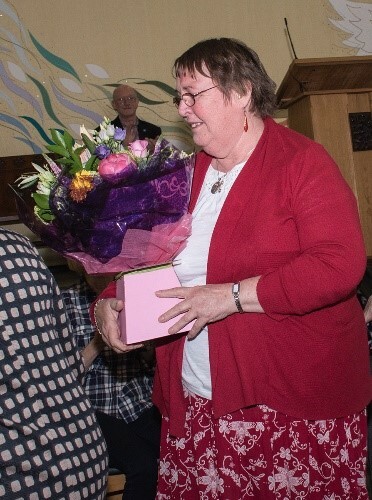 A particular thank you here to Elaine Neville who took over the organisation of the refreshments from Sheila Strang. Our newsletter continues to be of the highest quality thanks to Marie Potts. We are delighted that she has agreed to continue as newsletter editor and to remain on the committee even though she has stepped down as Communications Officer. Please group leaders keep sending Marie reports and photographs of your activities. We thank Marie for all her efforts to keep members informed on all kinds of U3A matters and we are grateful that she has worked so closely with Celia Billau ensuring a very smooth transition as Celia takes over from her. Another significant development is our adoption of the U3A National administration management system called Beacon. This system will computerise all aspects of our administration which becomes more onerous as the membership increases. Eventually there should be the opportunity for annual subscriptions to be recorded and paid on line and the system should be useful for group leaders. Margot, Malcolm and Celia are working very hard to become familiar with all aspects of the system as they are gradually implemented.The coming year will hopefully see us move further forward as we continue to strive to provide a vibrant and lively U3A. 1. To further develop the use of the Beacon system. 2. To continue to extend the range of interest groups with a focus on groups which may have male appeal. 3. To encourage members to identify a subject for a study day. 4. To improve all channels of communication as our numbers continue to increase including the use of the Forum, Facebook and a monthly bulletin. We will endeavour to keep you informed about national and local developments and will continue to ask for your opinions/ideas. 5. To prepare for succession planning in readiness for any committee changes in a year’s time. 6. To look for ways to encourage more members to take an active role within our U3A. 7. To consider the challenges brought by the ever-increasing membership. Sadly, several members have passed away during the past year. We miss them and our thoughts are with their families and friends. The year hasn’t been without its challenges but the strength of the team has helped us through. I’d like to thank you all most sincerely for continuing to be part of Beeston U3A and we look forward to another successful and exciting year. March 2017 Newsletter – A Message from the Chair, Sue Blackley. As always, many thanks to all the volunteers who keep the wheels turning for Beeston U3A. However, I will reiterate some of my words from the last newsletter. Please remember that U3A is ‘FOR THE MEMBERS BY THE MEMBERS’ so we need you to play your part particularly when we are trying to start new groups. A U3A does not provide services for its members -members provide them for each other. As our membership continues to increase we need to be starting new groups all the time but we can only do this with your help. Also, long standing group leaders sometimes feel they want a rest or their change in personal circumstances means they can no longer run the group. At this point we need other members of the group to step in and take over so that it doesn’t fold. This happened very successfully with the History group which is now run by a team. We had a very successful Group Leaders meeting in January. Many thanks to all who attended. We really value your comments and suggestions and we hope you found the event worthwhile. Please remember to renew your membership as soon as possible. We will be asking group leaders to check membership cards in due course. If there is any aspect of your membership that you are not happy about, please let one of the committee know. Following on from a suggestion at the Group Leaders meeting we now have a forum on the Beeston U3A website where you can ask questions or post comments. I am delighted that we have recently co-opted Celia Billau onto the committee. Celia is taking over from Marie Potts as Communications Officer so you will soon be receiving emails from her as communications@beestonu3a.org.uk. Marie will continue to produce our fantastic Newsletter and still be editor@beestonu3a.org.uk so please continue to send your articles to her. I’d like to take this opportunity to thank Marie for all the work she has done over the past six years. She has kept everyone informed and played a major part in the success of Beeston U3A. She has done a huge amount of work over and above her specific roles and has been a constant support to all members of the committee. I’d like to thank Lucy Beardsley as she continues to find an excellent variety of speakers for our monthly open meetings. If you don’t come to our monthly meetings you don’t know what you are missing so, please give it a try….. free tea and coffee too!! Our Burns Night event was superb. Janis Patterson our Events Organiser produced a delicious four course meal with very little help which was followed by a great ceilidh. An excellent evening enjoyed by all and we are looking forward to next year! Don’t forget to get your tickets for the Quiz evening which takes place on Friday April 7th at Chilwell Manor Golf Club. Our next event is the Group Fair on March 2nd where we will showcase our U3A. Please bring along any friends or relations who may be interested. The event is free. Hope to see you there.